Need proof of vinyl’s resurgence? Get ready for the first ever Record Crawl. On Sunday, November 13, collectors and audiophiles alike can join together for an afternoon perusing some of Chicago’s top record stores. Yes, it’s like a bar crawl that exchanges drinks for vinyl, CDs, tapes and more. The event is being thrown by CHIRP, or the Chicago Independent Radio Project, which is an online radio station that launched in 2009. The idea of CHRIP is to provide Chicago residents with a station that helps to not only promote independent local music but to represent Chicago’s diverse communities and neighborhoods. CHIRP was also voted best overall radio station in the 2011 Chicago Reader Reader’s Poll. The Record Crawl kicks off at 11 a.m. on Sunday, November 13, at Atomix Coffee Shop in Chicago’s Ukrainian Village neighborhood to give crawls a chance to fuel up with some caffeinated beverages. From there, the crawl will hit up six of the city’s best record shops including Permanent Records, Dusty Groove Records, Favorite Records, saki, Logan Hardware and concludes at Laurie’s Planet of Sound in Lincoln Square. Those who attend will also be given a limited edition Record Crawl badge that will give participants special discounts and exclusive gifts. 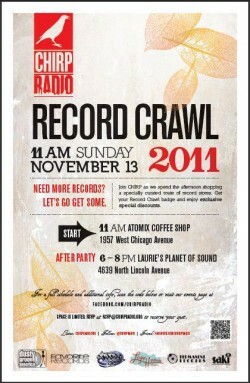 The Record Crawl is a free event, but CHIRP is asking those who wish to attend RSVP by e-mailing rsvp@chirpradio.org. Get all additional info at the CHRIP’s Record Crawl Facebook Event Page.